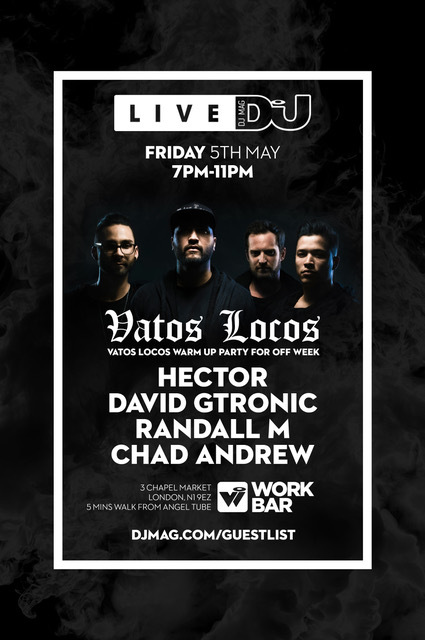 Hector and his Vatos Locos crew join DJ Mag Live to host a special Off Week warm-up event in London on Friday 5th May. You can sign up for free guest list below. The event kicks off as a panel between Hector and three of the core Vatos Locos crew members; Chad Andrew, David Gtronic and Randall M.
Following the panel, Hector, Chad, David and Randall will be showcasing music from the VL Recordings label and beyond, as they spin for DJ Mag Live at Work Bar. Hector will be fresh off the back of massive VL showcases at Miami Music Week and Sunwaves Festival Romania. He will also be preparing for VL’s busiest spring/summer to date, which sees them hit Marvellous Island Festival in Paris, Movement Festival Detroit – to host the official opening party with Stacey Pullen – all before their Off Week showcase that takes place at City Hall for the second year running. Since launching at The BPM Festival in 2015, Hector's Vatos Locos event concept has deservedly gained global credibility as the family continues to extend worldwide, not only via events, but also the VL Recordings imprint, all sharing the same ethos: no headliners, no egos, just quality music. You can see more information below, and sign up for free guest list on the event’s Facebook page.